This is what I wore yesterday but didn't end up having enough time to post before I went out with my friends. I can safely assure you all I look nothing like this at the moment, I look the girl from the ring in doughnut pj's and a pink dressing gown! Never again am I going out... Im nursing a very, very sore head today! I've barely managed getting up and out of my bed! It's a Bank Holiday weekend so its acceptable to be incredibly lazy right? Well, I'll keep telling myself that as I stuff my face with Dominos, hot cross buns and paracetamol! Love everything your wearing, and the necklace is gorgeous. Hope you feel better soon Lily! I love the jumper! Also your nails and make up look fab! Love the colour of that jumper. I never find any nice knitwear in Primark! lovely outfit, the jumper is gorgeous! i know you often post pics on twitter, but would you ever consider posting outfits you wear out?! i knew what you meant! probably not, purely because I don't like getting dressed (to go out) up for no reason ie. id put the clothes/makeup on during the day and just stay in, and if i was to take a outfit picture before I went out i'd have no lighting (as it would be too dark) and wouldn't come out right. Like you said I do post them on twitter/instagram a lot so its worth checking their on a saturday night! Love the color of the jumper! ha no not at all! i just think the skirts quite sort after! I've seen it go for £30+ before on there! 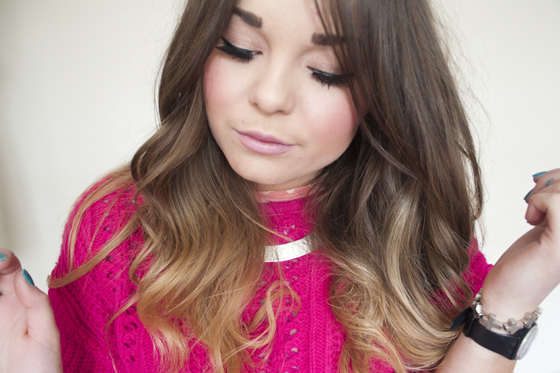 Such a cool outfit, I love that amazing jumper, such a cool shade! And yes, it is perfectly acceptable to do nothing on a bank holiday weekend, hope you feel a bit better soon hun! I love this outfit you look amazing! its perfect isn't it! so simple! love this outfit! i wish that colour pink suited me! You look so pretty on pink! Love this outfit, jacket with that fur looks so cool! do it! its my favourite nail look! bright colours layered with glitter! I love the pink with the black, what a great primark find! The hot pink hue looks smashing on you! wow! this outfit is soooo cute!!! Wow, I can't believe most of this stuff is from Primark aka Primarni - I'm going to have to get myself in there quick smart. Lily can we share wardrobes please? :P Haha just absoloutly gorg as alwyas..also your hair looks very pretty and healthy!! Enjoy your weekend!! I have that jumper in peacock colour - you've made me want to did it out again now. Gorgeous! Well that jumper is just the coolest. Primark is my one true love. The colour of the jumper is so pretty. 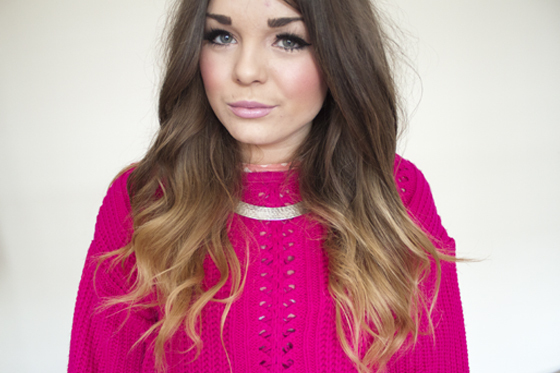 love the pink sweater...i wish we had a Primark in Canada, i keep earing about it!